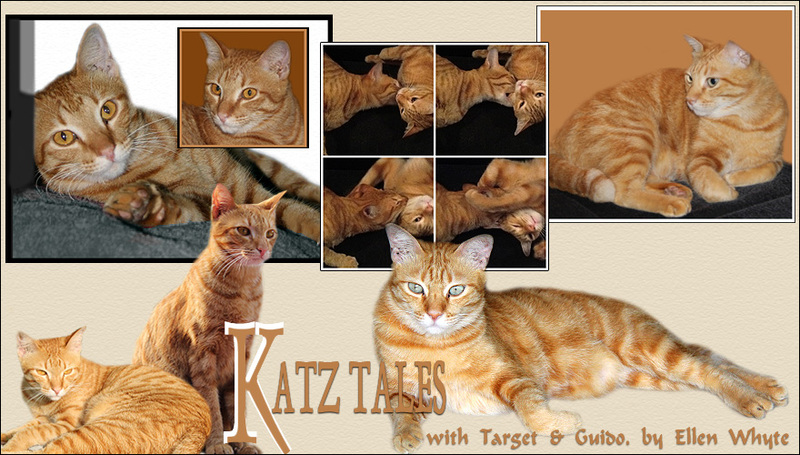 Katz And Other Tales: We're Back! 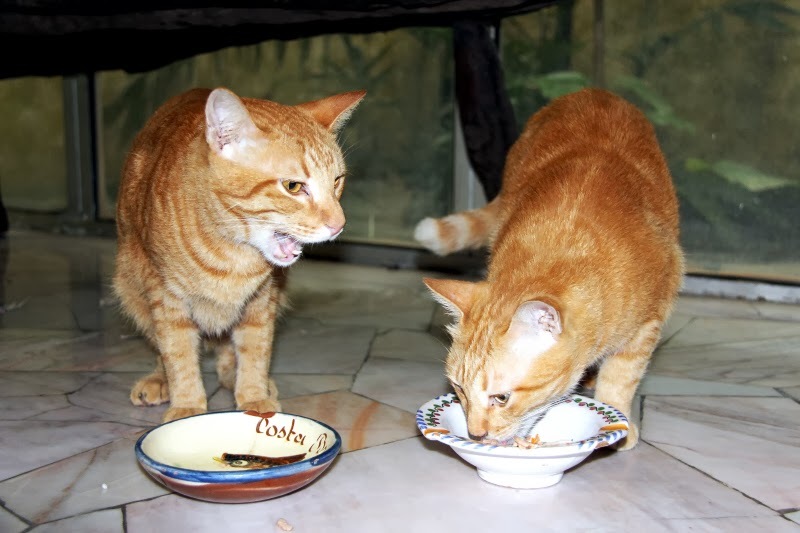 Target: Mummy Cat went away and she left us all alone! Guido: T-man stayed home. And he took time off work. Target: T-man doesn't carry me sideways like Mummy Cat does! And he doesn't call me his little kitten kursqueezul! Guido: He shared his pillow with you, and I enjoyed getting half of the bed all to myself. I was a Flump Kitty all night long. Guido: T-man cooked liver for us. With bacon. And we got seconds of efurrything. 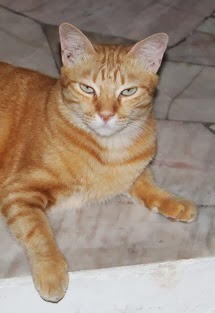 Target: Now Mummy Cat's back, I'm never leaving her out of my sight! Guido: I can hear her opening up some of that yummy tuna we like. Come on, Target, if we act Hurt and Abandoned, we might get seconds. Target: I am hurt! And I was abandoned! Guido: You're a fur brain, Target. When she comes, let me do the talking, ok? I'm back but reeling with jet lag. Will visit you all in the next day or so. In the meantime, don't forget to roll your mouse over the pictures to see Target and Guido's secret thoughts. And if you're looking for a fun, romantic read, check out Lost Weekend, rated an average of 4.5 out of 5 on Goodreads, Kobo, B&N, Smashwords, iTunes and other outlets. Welcome back to the Mom! It's always the best when Moms are home! wow great news! Now mom needs peaceful naps and rest a lot due that jet lag. Oh yes, it's impawtant to make the 'rents suffer for their abandonment! Welcome back! It would seem, though, that you were pretty well taken care of...dare we say spoiled...in her absence. LOL. Have you managed to make your Mom feel really guilty for leaving you yet? Well, we sure are gald to see you, we have missed you!!! The Mom is home again and all is right with the world. So glad to hear your primary care person is back again. Just like us. Do what we did, and acted like we've been deeply hurt by their abandonment and you'll get extra treats and yummies. oh yes they need to give you a good talking to! We are so happy you survived your ordeal! At least you got some extra noms out of it. It is a miracle you two survived! ;) Thank goodness your mom is finally back! You complain ? Arthur is rather happy when I am away and the others too, except Rosie because she doesn't like treats and junk food ! imagine ! what a strange cat she is ! Funny how the cats view things so differently. Welcome home! Welcome home, Mummy Cat! Errr.... how exactly do you carry a cat sideways? Welcome BACK!!! I know the boys are past delighted!!! Welcome home - we enjoyed your photos of the trip. Love the secret thoughts! Yay for Mom being back and you getting tuna!!!! Woohoo!! Whoa! You guys have different stories. I hope he did cook with bacon and give you seconds. Wow. That was the most interesting conversation! Humans are SO BORING when they natter on about their stoopy stuff.